The agency responsible for providing direct provision accommodation does not have access to death certificates on any of the 53 people who died in the last ten years, according to Minister Alan Shatter. 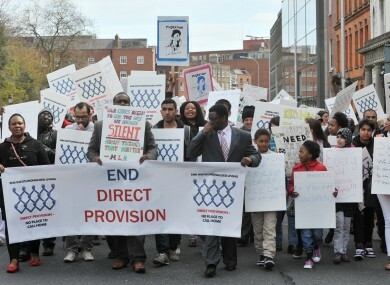 A march this year calling for an end to direct provision. OVER THE LAST ten years, 53 people have died while living in the direct provision accommodation for asylum seekers in Ireland. In a recent parliamentary question, TD Derek Nolan asked Minister Alan Shatter how many of these deaths were by suicide but the minister responded that the agency responsible does not have access to information on the causes of death of these people. He said that while the Reception and Integration Agency (RIA) may have general knowledge of the cause of death, it “does not, indeed cannot, hold or have access to death certificates”. In his response, Shatter added that information provided by relatives or friends of the deceased indicate that causes of death ranged from cancers, heart conditions to traffic collisions and in the deaths of children under the age of five it is believed that a number may have died from cot deaths or were still births. However Shatter said that these records are based on informal information and are not official records of death. Only one of these deaths can, with certainty, be said to be a suicide according to the minister and he said that involved a newly arrived asylum seeker taking his own life in 2008 while in hospital. Speaking to TheJournal.ie, Sharon Waters of the Irish Refugee Service described the lack of information on deaths and the number of suicides in direct provision accommodation centres as “shambolic”. “It’s an issue that a number of people have raised over the years but to get the information it would mean going through every coroner’s court in the last ten years, which is time consuming but something that we hope to be able to do in the future,” she said. Waters said many asylum seekers living in the centres go to the refugee service in a “very distressed state” – many self-harming and threatening suicide. “The agency take the approach that it’s not responsible for the people involved, it’s just there to provide them with accommodation and food, but the fact is that these people are highly reliant on RIA and there are a lot of controls on them”, Waters commented. Many people living in the centres fear complaining about food shortages and overcrowding – which Waters said are the biggest problems – because those who complain are often moved and they worry that speaking up will impact on their applications for asylum. The spokesperson added that this means that their “capacity to complain is quite limited” as any complaints they have about a centre must go through management at the centre itself. The Ombudsman, Emily O’Reilly, has previously been critical of the amount of time people are living in these hostels, with recent figures showing that there are 600 people who have been waiting more than seven years, living in direct provision, for a decision on their application. Over 1,800 have been waiting at least five years, living on a weekly allowance of €19.10 provided by the State. Sharon Waters said that research has shown that there is an “unusually high level of either depression of mental illness” among asylum seekers living in direct provision hostels and this is often exacerbated by prolonged residence at these centres. The Ombudsman spokesperson said there are very few options open to asylum seekers if they decide to leave the hostels as they are not entitled to social welfare benefits. “If they leave [direct provision], it’s very difficult to get any other support from the State- it’s not like being sent to prison, because people choose to go into direct provision, but if you don’t go there, in all likelihood, you will have nowhere else to go,” they said. In response to a query from TheJournal.ie about supports for asylum seekers, a spokesperson for the Department of Justice said it all EU member states operate systems for dealing with asylum seekers “which in one form or another greatly restrict their access to welfare, work or independent housing”. “In reality, the system in this state is at least on a par and often significantly better than that in operation in many other member states,” they added. Email “Lack of information on asylum-seeker deaths 'shambolic' ”. Feedback on “Lack of information on asylum-seeker deaths 'shambolic' ”.